Askernish Golf Club is home to "the most natural golf course in the world" - (2011 visitor). The course and club has a long and almost mythical history. Old Tom Morris came to South Uist in 1891 to create a course at the request of the wealthy land owner, Lady Cathcart, so that she could impress her high society guests. Old Tom created an 18 hole course that was maintained by the local crofters until the early 1920s when the demand for golf declined and social pressures on the local people meant that maintaining the course was not viable. Over the course of the next 80 years the course that Old Tom created was taken back by the wild. The land was kept as 12 holes, and 9 holes, and 9 holes with 18 tees, and was also used as an airstrip. In 2005 a group of locals decided that they wanted their course back and set to work, with the help of some the golf industry's biggest and best names, restoring this 'lost' course. In 2008 the course was reopened as an 18 hole facility that has received the highest acclaim from golfing media and beyond, including BBC 2's Coast. The course begins with a 6 hole loop which includes 2 par 5s. These holes give you a gentle start where undulating greens and large elevation changes provide the challenges to prepare you for the coming 12 holes. 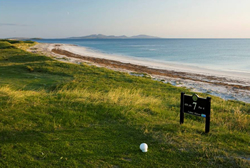 When you reach the 7th tee you are greeted by the Atlantic Ocean, views of Barra and you are presented with golf holes that run through some of the most brilliant dune systems in golf. The 8th hole is a short par 4 that is easily reachable in one for the big hitters but is guarded by steep drop offs to the right of the entire hole and the back of the green so being brave is essential if you wish to achieve an eagle or tap in birdie. If you wish to experience a true links course and a wonderful golfing experience then Askernish is for you.